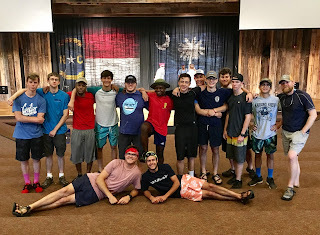 This summer I took some high school guys on a trip to the North Carolina mountains. One day, while we were leaping off of waterfalls, one of the older guys surprised me and refused to jump. I debated just letting it go, but I knew it was safe and he’d regret not giving it a shot, so I pushed him. I pushed him hard. Not with my hands, but with my words. And he wasn’t happy with me, but he did it. And finally, after he came up out of the water, the tenseness in his face had melted into a smile. Usually, when we’re afraid of something God is calling us to do, we can expect that same pattern to occur. It starts with us refusing to jump. And then eventually giving in. And then we finally get to experience the joy of obedience. We see that same consistent pattern happen throughout Scripture. Whenever God calls someone, the call is almost always followed by fear. God calls an ordinary person to engage in an act of extraordinary trust, and that person naturally experiences fear. It seems that God has a habit of asking people to do things that are scary to them. Why would a loving God do that? Because he longs to see us transformed. God is calling all of us to be a part of something much larger than ourselves. He’s inviting us into his God-sized plans. And he knows we’re creatures of comfort. God is aware that being a Young Life leader and sharing the Gospel with teenagers is often out of our comfort zones. But he also knows that comfort hinders growth. His deepest desire for us is that we would be transformed into his likeness. And often, he invites us into a life that requires stretching faith, in order to transform us. The next time you experience fear, remind yourself that it’s merely a Godly invitation into transformation. Lord, Give us a faith that makes you marvel. We know that you are the author and perfecter of our faith. And that even the ability to trust you is a gift from you. But that your plans for us are good. Lord, pursuing teenagers is hard. But it’s also full of hope, excitement, adventure, and deep joy. Give us faith in the One who is always faithful. Give us faith in the One who’s timing is perfect. Give us faith in the One who endured the cross on the way to an empty tomb. Oh Lord, give us faith. Amen. Check out this new music video from YL Musician, Christopher Williams.